Today, January 17, we celebrate the 120th birthday of that great banjo luminary, Harry Reser. He was born on that day in 1896. Reser is known for his great multitude of recordings under an enormous number of names in the 1920s and 1930s, perhaps the most memorable of which were the Clicquot Club Eskimos, who took their name from the brand of ginger ale that sponsored a radio show featuring Reser’s band. Reser also recorded under many other band names, including the Clevelanders, the Six Jumping Jacks, and, as in this case, his Syncopators. Many of his groups featured vocals by Tom Stacks. Last time we heard from them was on Christmas Day. Harry Reser was born in Piqua, Ohio, and was a first cousin of the Wright brothers. He was a child prodigy on string instruments and had perfect pitch. By the early 1920s, Reser was playing banjo professionally, and by the second half of that decade, he was headlining Clicquot Club’s radio program with his “Eskimos”, a position which he and his band held for over a decade, from 1923 until 1936. 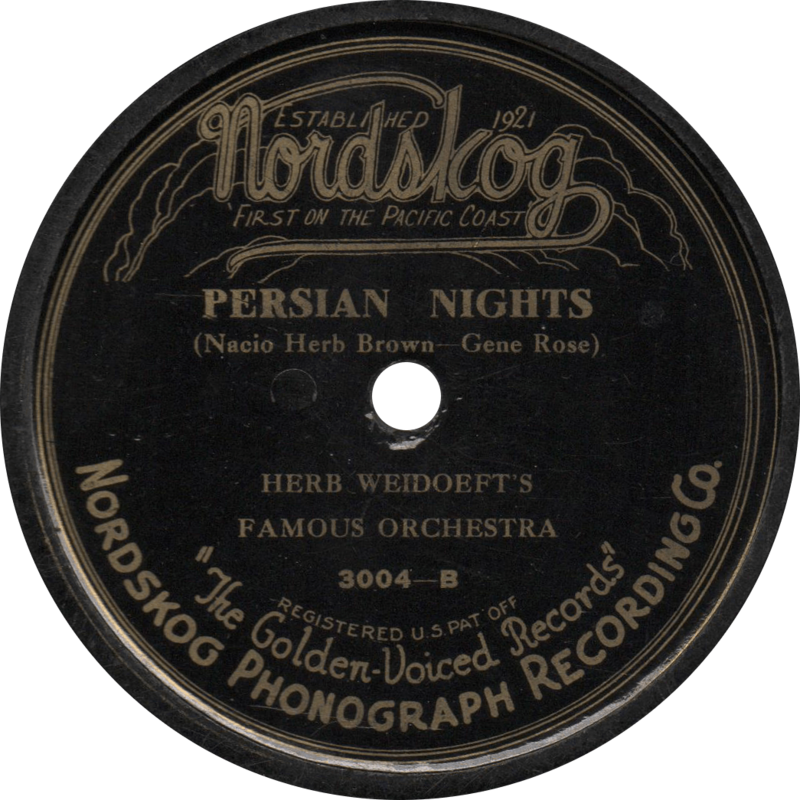 In 1936, he recorded a short film with the Eskimos for Vitaphone. Though Reser faded from the spotlight after the 1930s, he remained an active musician until his death in 1965 in the orchestra pit at the Imperial Theatre in Manhattan. 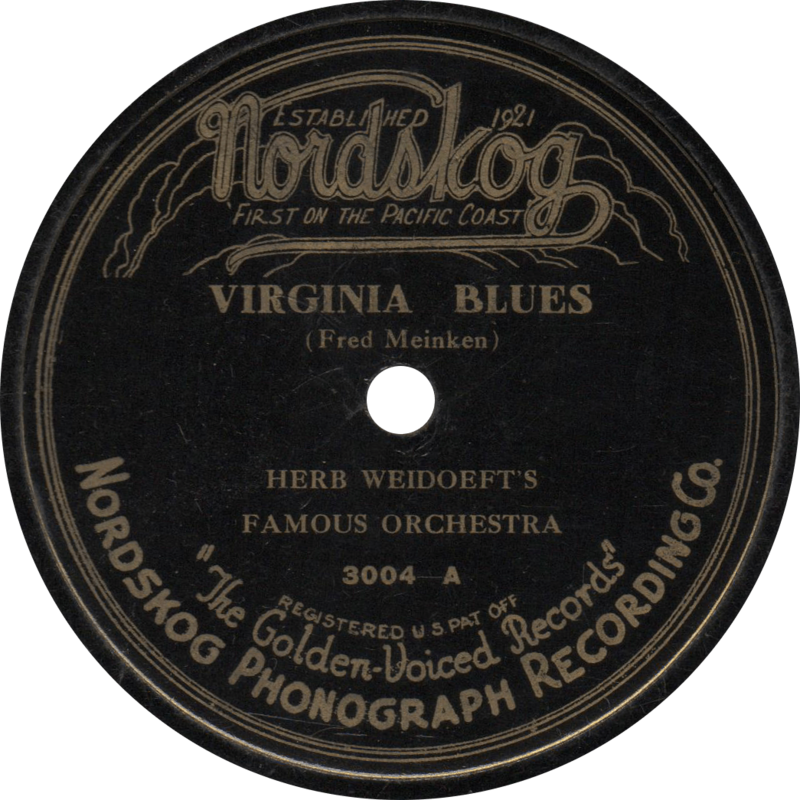 Columbia 1761-D was recorded March 7, 1929 in New York by Harry Reser’s Syncopators, with a vocal on both sides by Tom Stacks. Both sides also feature a riveting bass saxophone and all-around superb musicianship, making for an excellent pair of recordings. As far as I can tell from the nearly incomprehensible Dance Band Discography (this one really ought to have been in Jazz and Ragtime Records if you ask me), this personnel of Reser’s Syncopators includes Tommy Gott on trumpet, Sam Lewis on trombone, Larry Abbott on clarinet, alto sax, and baritone sax, Jimmy Johnston on bass sax, Bill Wirges on piano, Harry Reser on banjo and Tom Stacks on drums. First, they play a great version of “Kansas City Kitty”, not to be confused with “Kitty from Kansas City”, as was featured by Rudy Vallée. 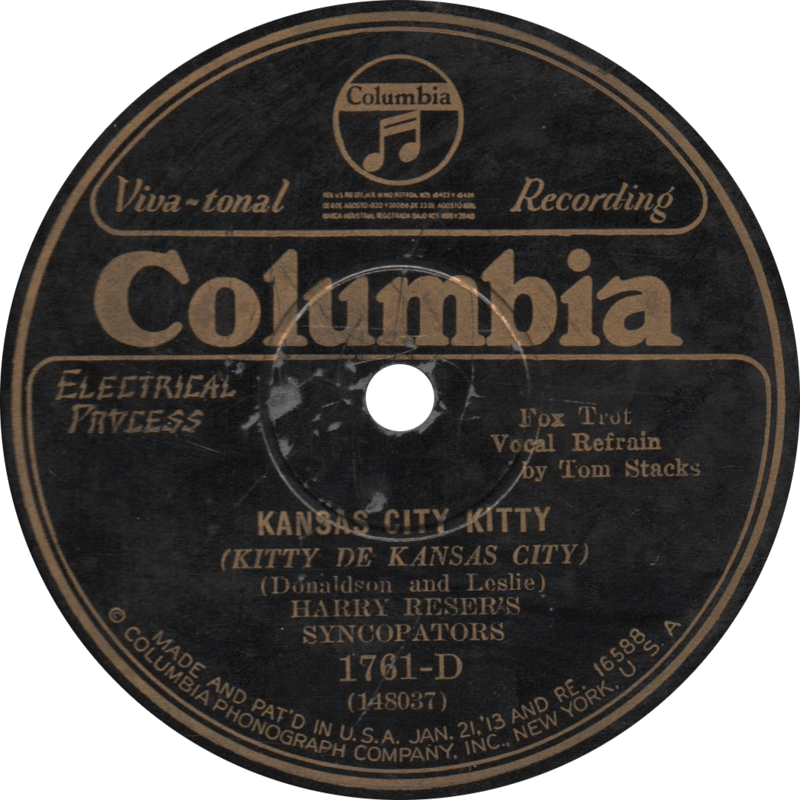 Kansas City Kitty, recorded March, 7, 1929 by Harry Reser’s Syncopators. The reverse’s title is quite a mouthful, “I’m Wild About Horns on Automobiles that Go ‘Ta-Ta-Ta-Ta'”, but this side remains one of my favorites. 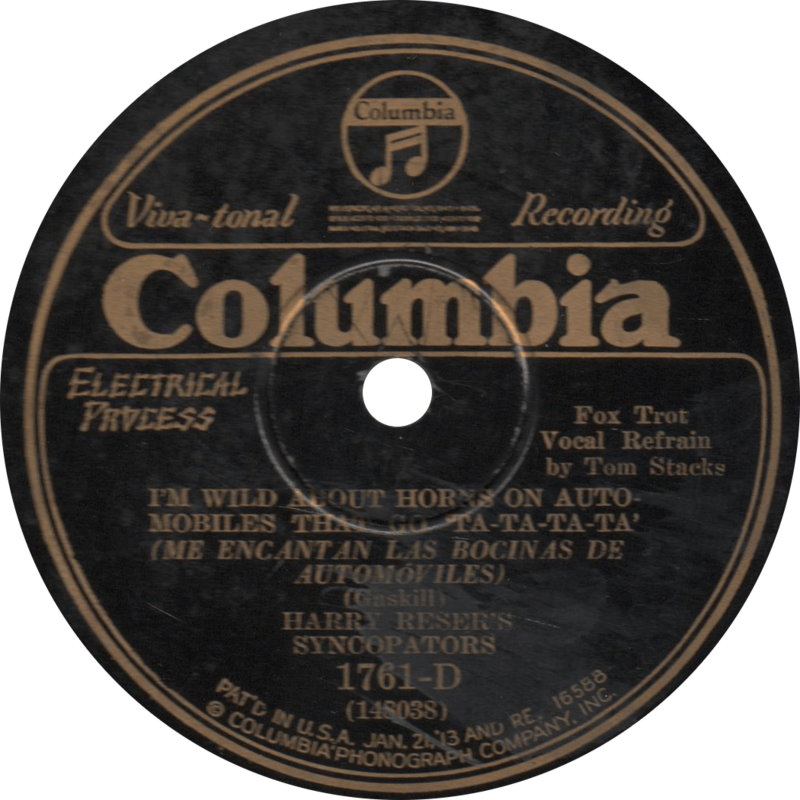 I’m Wild About Horns on Automobiles that Go Ta-Ta-Ta-Ta, recorded March 7, 1929 by Harry Reser’s Syncopators. Updated on September 4, 2016.